Our meal was provided, however, images, story & friendship are all my own! Someone once asked me why I post photos of employees at restaurants when I write up my pieces about the place. My answer: The staff and the owners are the pulse of places we eat at, and if they are a strong pulse, you can expect a great time. A photo is worth a thousand words and a great meal is the best way to end a marvelous day and I have both the photos and the meals to show you today. As you know traveling to the Outer Banks is an amazing destination on its own, and staying in and cooking each night was splendid, but this MOM needed a night off so we went out. We drove out of the village of Avon to dine at the Atlantic Coastal Cafe in Waves, North Carolina. 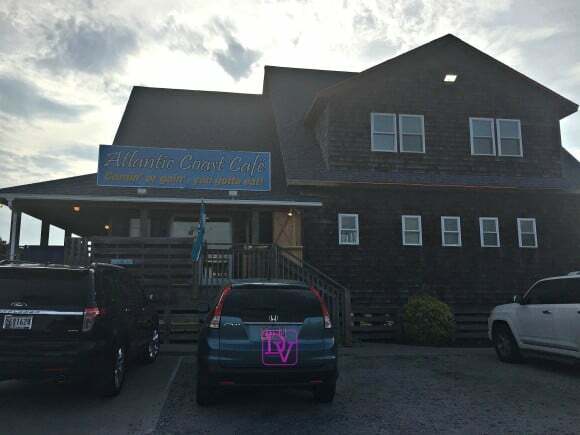 We chose the Atlantic Coastal Cafe in Waves because my son could eat there as the owners are all about allergen free dining for those guests that need accommodations and because I read rave reviews on Google and a few other places so I had to see what the food was like myself. Here’s to lavishly living food our food experience out loud, as we dine in the at the Atlantic Coast Cafe in Waves, with food that was allergen free, and loaded with flavor! Did you ever think about options that you have and then look back at the choices you made and just know you chose right? The biggest gift I had recently was choosing the right new friends, the right place to dine and enjoying a night that my family will cherish for a long time to come. This night was a night spent at the Atlantic Coast Cafe in Waves with Jodie and Matt and their really great staff. I believe my dining tale is best told through my photos and what all happened while we were there, as we discovered delicious food, a welcoming staff and new friends. 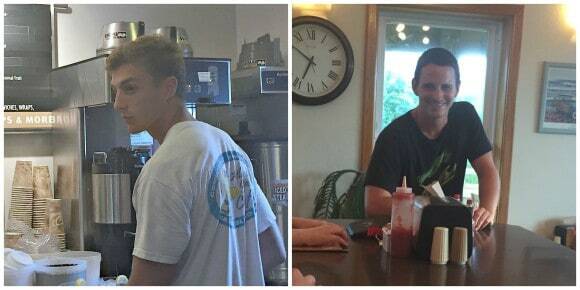 Meet Matt and Jodie the owners of the Atlantic Coastal Cafe in Waves, North Carolina. They are partners in both marriage and at their restaurant, they are a wonderful couple and their goal is to make your time at their restaurant amazing and satisfying, which they more than achieve. 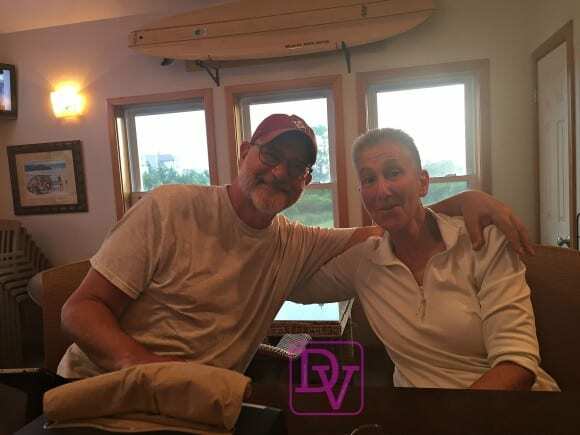 Jodie and Matt have been frequenting the Outer Banks since 1987. They would bring their children there and now they are bringing their grandchildren there. They live here part time as well and their objective when creating the Atlantic Coast Cafe was to give back to the area and provide delicious dining. As you can see in the photo there are 2 great people and great attracts wonderful great, and that is the staff you will find.. wonderful staff, service and food at the Atlantic Coast Cafe! The Atlantic Coast Cafe in Waves is open for breakfast, lunch and dinner and you can have breakfast for lunch, or breakfast at any point in time during the day. The cafe touts awesome breakfast sandwiches and you might want to know that on the weekends, they are super busy because their breakfasts are that good! 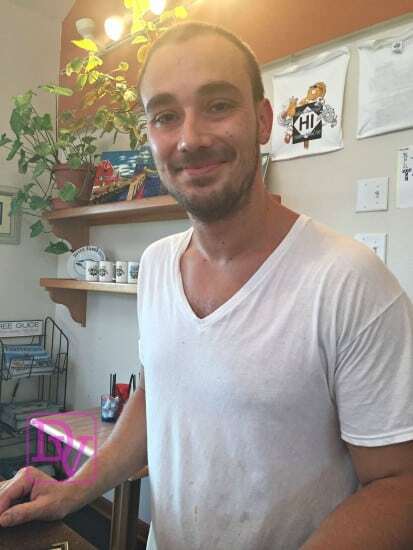 Here’s Stan, he made my son allergen-free food, and he has a Bible of Food Ingredients, that helped us determine what my son could and could not eat. If you have allergies, all you have to do is alert the staff that you have food allergies and they will work to match you up with food you can eat and supply the BIBLE of ingredients so you can double check as well. 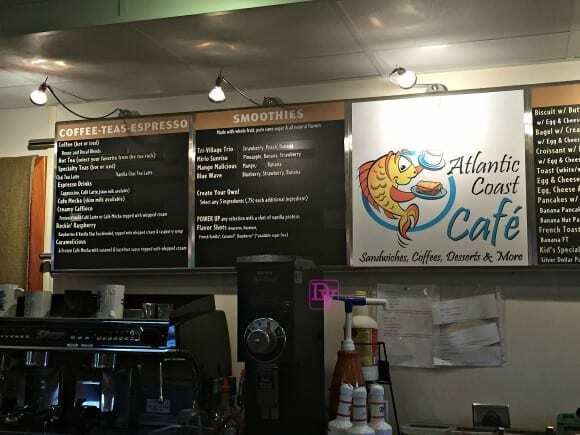 Speaking of staff, let’s meet John and Scott, and let me offer how the Atlantic Coast Cafe works, so you can walk in and order! Grab a menu, or look at the menu above the serving counter and take a seat, it is all real easy-going here. When you walk in, you can either go straight to the counter and order your food by the menu that is hanging, or you can take a menu, peruse, sit down wherever you want, and then go order. It is all up to you. We also met John and Scott they both work there and you will find them servicing you behind the counter as you order your food. They know the food inside and out and they can make some great insight as recommendations. But you really don’t need an insider’s perspective to figure out what’s good because everything on the menu is good. There were four of us and four for four had awesome meals in addition to wonderful sides. One thing I would love to share is the staff that works here is not a staff that just turns over, when you see them, get to know them, I am sure you will see them year after year, in fact, Matt & Jodie can’t compliment them enough and they are all like family! 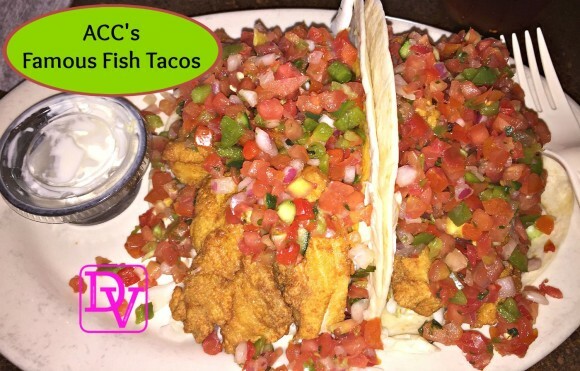 My daughter enjoyed the fabulous and famous ACC’s Famous Fish Tacos. What’s in these bad boys? This is both a soft and crunchy taco(double the delish) and hers was loaded with Fried Fish(you could choose grilled if you prefer)and the topping you see is the most delicious fresh salsa that consists of tomato, cabbage, cheese and jalapenos, OLE! 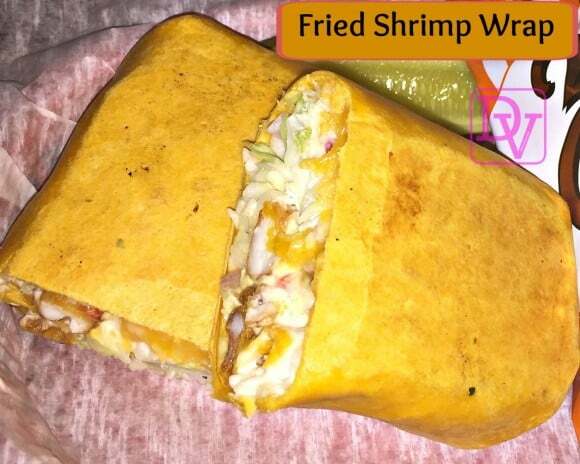 The meal I ate was called the Fried Shrimp Wrap, and the cabbage gave it a sweet sassy flavor. The shrimp were nice and juicy, while the shredded cabbage blend and lime tartar sauce made the flavors sail. The outside wrap was crunchy as it should be. My son is not an onion kid, and he rarely deviates from his standard Cheeseburger or bacon burger, but look at what he ate, I am simply impressed that he tried something new and ate it all! 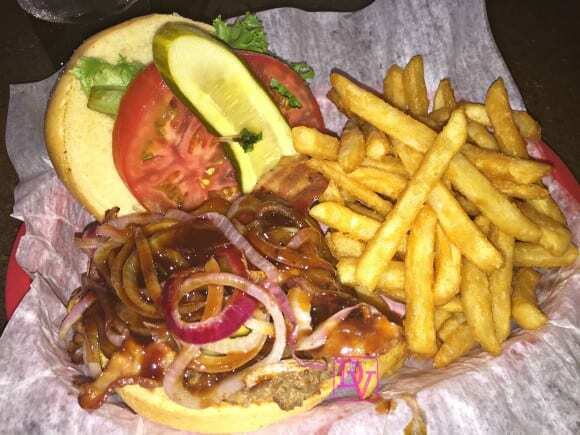 This is the Hickory Smokehouse burger and it is smothered in BBQ Sauce, grilled onions, bacon and cheddar cheese, served with a side of yummy fries. 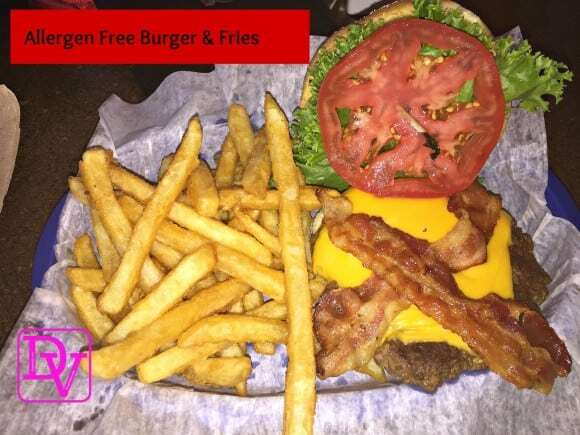 As for the little one with food allergies, he was thrilled to have a Bacon Cheeseburger that was allergen free and served with FRIES, that’s right the magic of Chef Stan made it possible for him to have it all! When you see the day is about to get ahead of you, and you end up spending the morning at the beach, no worries, grab a late breakfast sandwich at any point in time during the day. Their breakfast is known around the Waves are quite well so if you want breakfast, this is the place! Jodie and Matt know what it’s like to spend the day on the beach and have fun in the sun and then have a family to prepare food for it’s much easier and that is why they offer PICK UP! Yeah Momma! As a mom of a child with food allergies I am most appreciative that the Atlantic Coast Cafe offers great dining options to those with food allergies. The food is good staff and the staff is friendly. Lavishly live food out loud and allergen free dining in the Outer Banks at the Atlantic Coast Cafe. Our thanks to our hosts Jodie and Matt! Ooooo this place looks so yummy!!! Wish it was a tad bit closer so I could try it out myself! Pretty amazing they are prepared for people with allergies.. What a great service and great people they are! Their food looks delicious and it’s so nice to meet a friendly staff who can work with food allergies. It’s awesome that they’re so well prepared for food allergies! This sounds like a great place! The food looks so good. The food looks great! I love reading about new places and knowing its history a bit and you are right, the staff sets the atmosphere. It sounds lovely! oh, my goodness! Now I’m getting hungry. Food looks really good! This place sounds amazing! I’ll have to check it out if I’m ever in the area. This place sounds great! I’ll have to check it out if I’m ever in the area. It’s fun that they know food inside out. Sounds like a great place to visit! It would be great to have a cafe like this in the neighborhood! I gotta agree with you. No matter how good the food is, if the service is bad, you won’t put up with it and you won’t ever return. I say service matters just as much as the quality of the food. Those fish dishes look delicious! I love seeking out new places to eat that turn out to be real gems. YUM! Everything looks delicious. I would try the fish tacos if I were to visit. Pulled up the menu. This looks really good. And I am planning on spending time there this summer. Now I have something on the plan other than sunny. Thank you for the recommendation. Those food pictures made me hungry. It’s great to have restaurants that cater to your food allergies. That’s rare and it’s always nice when you encounter one. I love that they are so accommodating and friendly, that’s the key to a good, lasting restaurant. The extra crunchy tacos sound delicious, I am a vegetarian so do they have any veggie options too? Glad they have more than just seafood for those of us who don’t eat it. Sounds like a great restaurant.